When Brown delivers a package for me here at the office, all of the guys gather for the grand opening. One offers his pocket knife, the other cuts the packing straps. The women just sigh and shake their heads. Everyone knows it ain’t office supplies if it’s for me. It is in fact, most probably, a cool gadget. Last week the UPS man delivered a much anticipated new gadget. 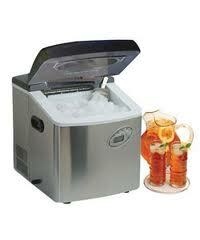 A Sunpentown IM-120S Portable Ice Maker. You know you want one, too. One of the big regrets over the past four years of our office lease was the decision to install a dishwasher, rather than an ice maker. At three times the price of a standard dishwasher, it was an easy decision. But I have regretted that cost-saving move ever since. Especially when summer arrives. The 25-pound box clearly marked DO NOT TILT MORE THAN 45-DEGREES, was immediately turned upside down and the inner box popped out onto the floor. (I didn’t see the huge red warning sticker until it was too late.) Inside was a 10x13x13-inch, piano black plastic box with cool chrome buttons. Sweet. Tossed aside was all of the foam packing, plastic wrap, and instruction booklet. Sitting there on the conference table we turned and inspected—now avoiding tipping it more than 45-degrees—checking out every detail. Quick, plug it in and let’s get this baby making ice. It’s a little loud. About every few minutes the bullet-sized and shaped ice plops down into the plastic bin. But you get used to it, especially when you are anticipating those crystal clear pristine ice bullets made from distilled water. Using the provided scoop, you deploy about 8-ounces of ice into your cup and voila! a cold drink! The women in the office suggest that we could go across the street and buy a 10-pound bag of ice for 99 cents. But what’s the fun in that? I met George Nolen of Pottsboro when I interviewed him for the story about Icky Twerp and Slam Bang Theater. His friends mentioned that Mr. Nolen was a poet, and so I asked him to send me some of his pieces. He did, and here are a few. But first, from this pen, a short introduction.